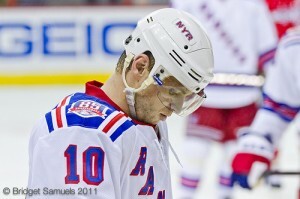 Business as usual for the New York Rangers translates into a philosophical introspection of the team, not the opponent. This is the working environment that Coach John Tortorella prefers. Torts is asking his team to concentrate on the future, lingering only in the past to improve for their future. In an interview today, Torts stressed to his team to not over think, but play the game to win. What differentiates the Rangers from their strategy compared to the other NHL teams in the playoffs is that the players will focus on watching clips of their own play, instead of exclusively watching clips of their opponent. Because the Rangers come off of two consecutive losses, there is homework to be done before the big test. The Eastern Conference champs face their first-round playoff series against the Ottawa Senators Thursday night at the Garden. This will be the first time the franchise has had home-ice advantage in the postseason since 1996. This season, Ottawa has beaten the Rangers three times in the four meetings, shutting New York out once and outscoring them 14 goals to 8. With Henrik Lundqvist on the cover of Sports Illustrated Playoff preview edition, NHL.com picking the Rangers to win Round 1, could this be a media hype jinx or a distraction? And if that’s not enough to focus their efforts, the Rangers are shutting down their twitter accounts for the playoff run. Odds are in the Blueshirts’ favor with Ottawa eking their way into the playoffs, while New York has remained consistent all season. Losing their last two games and the Presidents’ Trophy to the Vancouver Canucks cannot diminish the returns on the season. This playoff run will not be a disappointment for Captain Ryan Callahan, who missed last season’s playoff run. The anticipation is high and Callahan could become the key component in New York’s momentum. Cool and calm, the work ethic he models for his player is respected and followed. Both Callahan and Marian Gaborik missed playoff practice April 9 instilling some worry, particularly for Gaborik, who is coming off his second best season since becoming a Ranger three years ago posting 41 goals and 35 assists. Gaby exhibits the speed and skill the Rangers must have to win the series against Ottawa’s Jason Spezza, who finished the year with 30 goals and 54 assists. Ottawa’s weakness is in goaltender Craig Anderson. The starting goaltender had a 2.84 goals against average and .914 save percentage. Anderson tends to play well for a few weeks rather than the over the long haul. Anderson is the type of goalie who performs well for a team over a season or two, then burns out. His streak may end at the hands of the Blueshirts. The Rangers can count on likely Vezina finalist Henrik Lundqvist with his 1.97 goals against average and .930 save percentage. King Henry has been the Rangers’ most valuable player, but since March 1, Lundqvist has allowed 42 goals on 399 shots — a save percentage of .895. Lundqvist may still be coping with a bruised forearm he sustained in the conference-clinching win in Philadelphia last Tuesday. Shy of 40 wins after the 4-1 loss to the Washington Capitals, he remained confident going forward not concerned about the loss or the injury. The team comes into the playoffs as the Eastern Conference champ, and a team that can lack at times. No matter how many wins, how many penalty kills, the power-play or other stats, the beginning of their season is now. All the work in the regular season is a means to an end. It counts for a lot, but it’s the playoff run that is the test of the season’s performance. In an odd way, the Rangers come in as the underdog in that they are expected to win hands down. If they falter, watch the statistical analysis to give way to New York’s critics, good or bad.